CMP Achievement Medal cut scores are used to determine the shooters in As-Issued Military Rifle Matches who receive these medals. Shown here are (l. to r.) the silver, gold and bronze medals currently awarded during the National John C. Garand Match at Camp Perry. One of the most popular goals for competitors in CMP As-Issued Military Rifle and Rimfire Sporter Matches is to fire a score good enough to earn a Gold, Silver or Bronze Achievement Medal or Pin. Competitors in the CMP Games Matches at the National Matches are awarded medals with neck ribbons when they fire scores that exceed Achievement Medal cut scores. Competitors in the Eastern and Western CMP Games Matches also are awarded medals with neck ribbons. Clubs that sponsor As-Issued Military Rifle or Rimfire Sporter Matches can award, Gold, Silver and Bronze Achievement Pins for scores fired in CMP sanctioned matches. CMP Achievement Medal scores are achievable by all shooters who are willing to put reasonable effort into learning basic marksmanship skills and doing some extra practice. Cut scores are calculated on the basis of where the 40th percentile lies in scores fired at National and Regional CMP Games Matches when weather conditions in those matches are reasonable. After the 40th percentile score level is determined, scores above that point are divided into first one-sixth, next two-sixths and next three-sixths divisions in the same way that EIC match scores are divided into 10, 8 and 6-point legs. This breakdown then determines the gold, silver and bronze score levels. CMP Achievement Medals with neck ribbons are also awarded at the Western and Eastern CMP Games Matches. Shown here are the silver, gold and bronze medals awarded for M1 Carbine Match scores in the Western CMP Games. Once cut scores for the year are determined and posted in the CMP Competition Rules, those scores are used throughout the year to award Achievement Medals or Pins. For example, in the 2008 National Springfield Rifle Match, 743 shooters completed the match and turned in scorecards. 26 of those competitors fired scores of 278 or higher to win Gold Achievement Medals, 90 shooters fired scores from 270 to 277 to earn Silver Medals and 139 competitors fired scores between 260 and 269 to receive Bronze Medals. In evaluating last year’s Springfield results, we ended up with less than 40 percent of the shooters earning medals. As a result, 2009 Springfield cut scores were adjusted downward. John C. Garand cut scores remain nearly the same while Vintage Military Rifle scores went up because 2008 medals counts were above 40 percent. Carbine scores dropped slightly, while Rimfire Sporter cut scores increased, especially in the O-class where more shooters are learning how to produce good open sight scores. All of the new Achievement Medal and Pin Cut Scores that will be in effect throughout 2009 are listed in the chart. New this year are cut scores for one of the new National Match Air Rifle events, 20 shots standing with a sporter air rifle fired on the 200-yard highpower target reduced for 10 meters. These cut scores are based on scores fired in the 2008 National Matches Air Gun Events. 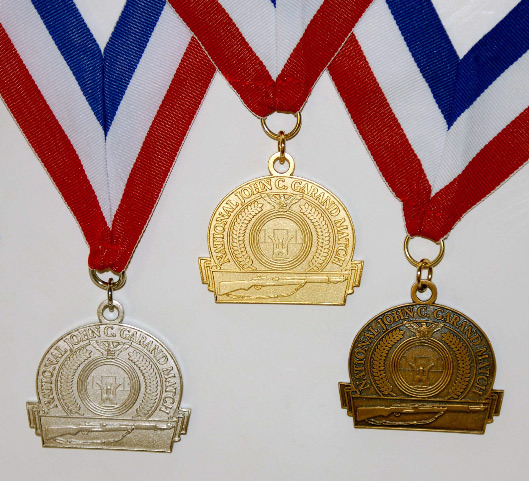 Official Achievement Medal scores for the year will be published in the new 2009 CMP Competition Rules or CMP Guide to Rimfire Sporter when those publications are released in the next few weeks. Official rules for the new National Match Air Rifle events will be released after feedback from a 10 January Test Match is evaluated. Programs for the test match are posted at http://www.odcmp.com/Competitions/10Jan_New%20Program%20_2_.pdf. In order to give match sponsors flexibility to adjust for difficult wind or climate conditions, a new rule is being developed for the 2009 rulebooks that will allow bronze medal or pin cut scores to be adjusted downward to a match placing that allows a maximum of 40% of the competitors in that match to receive awards. This was done in the 2008 Western CMP Games where strong winds made it difficult for shooters to attain medal-winning scores. 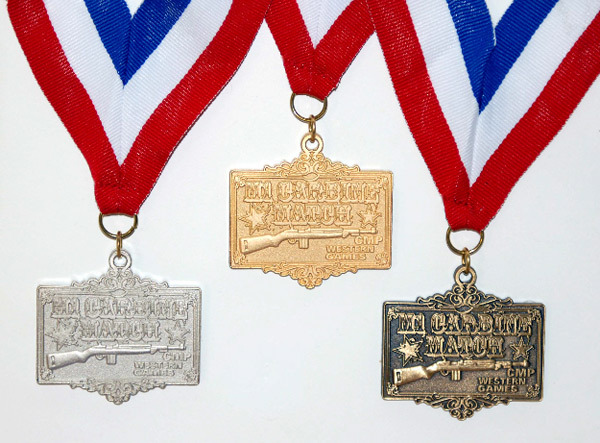 CMP Achievement Pins are awarded at CMP sanctioned matched for (l. to r.) the John C. Garand, Springfield Rifle, Vintage Military Rifle, Rimfire Sporter and M1 Carbine Matches. Gold, Silver and Bronze medallions with neck ribbons are awarded only in the National Matches and Eastern and Western CMP Games. 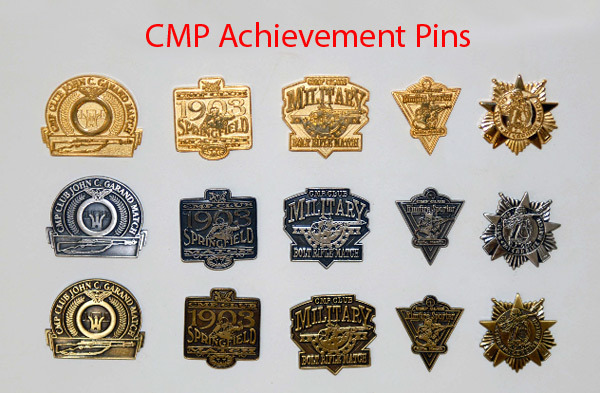 Gold, silver and bronze award pins can be awarded at any CMP-sanctioned match that includes one or more eligible events. Match sponsors that want to award pins to competitors in their matches should order them for $1.00 each from the CMP when they complete their match sanctioning application (form posted at http://www.odcmp.com/Competitions/Sanction.htm). With an inventory of pins on hand, the awards can be presented to shooters immediately after they fire a score that meets the cut score standards.